^ John Docker (30 June 2008). “Are Settler-Colonies Inherently Genocidal? Re-reading Lemkin”. In A. Dirk Moses (ed.). Empire, Colony, Genocide: Conquest, Occupation, and Subaltern Resistance in World History. Berghahn Books. p. 95. ISBN 978-1-78238-214-0. ^ Rajiv Molhotra (26 April 2009). “The Challenge of Eurocentrism”. In Rajani Kannepalli Kanth (ed.). The Challenge of Eurocentrism: Global Perspectives, Policy, and Prospects. Palgrave Macmillan US. pp. 180, 184, 189, 199. ISBN 978-0-230-61227-3. ^ Michael D. Green (15 March 2008). ““We Dance in Opposite Directions”: Mesquakie (Fox) Separatism from the Sac and Fox Tribe*”. In Marvin Bergman (ed.). Iowa History Reader. University of Iowa Press. p. 28. ISBN 978-1-60938-011-3. ^ John P. Bowes (2011). “Ogden Land Company”. In Daniel F. Littlefield, Jr. (ed.). Encyclopedia of American Indian Removal. James W. Parins. ABC-CLIO. p. 158. ISBN 978-0-313-36041-1. ^ Russell Thornton (1 June 1992). 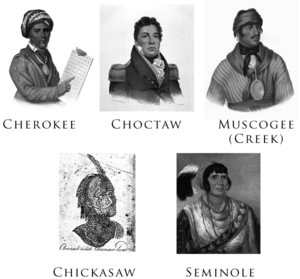 “The Demography of the Trail of Tears Period: A New Estimate of Cherokee Population Losses”. In William L. Anderson (ed.). Cherokee Removal: Before and After. University of Georgia Press. p. 85. ISBN 978-0-8203-1482-2.